Danshui is a suburb of Taipei at the end of a train line. At different times, it has been settled by the indigenous population, the Spanish, Dutch, Japanese and (of course) the Han Chinese. 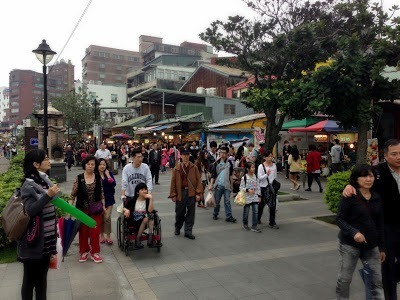 It is a popular weekend destination for Taiwanese. We happened to be here on a long weekend due to the public holiday called “tomb sweeping day”. Not that we really noticed any difference between the public holiday and other days. 1 Why did we come here? 2 What did we do? 5 Do we stay or do we go? To be honest, we had hoped to spend the weekend further south in Taiwan, but we took awhile to make up our minds on exactly where, and then we couldn’t find accommodation at the places we wanted to go. Places book up in Taiwan fast!! We were thinking we would have to leave the country earlier than planned, when I finally found some ok sounding accommodation in Danshui. This isn’t to say that we didn’t want to come here. We had it written down as a possible day trip from Taipei. It sounded like there was plenty to keep us busy here for a couple of days, so it seemed like a good plan! Here’s some of the other best things to do in Taipei. We caught the train up round lunch time on Thursday. We were worried how difficult it would be with all our luggage, so I took one of suitcases and left it in a luggage locker at Taipei main station before we set out. We will be going back through here, and it will be nice to have a few days away from it!! It wasn’t that hard to shed half our things for a few days, and it excites me to think that Z won’t have to be much older before we probably could travel with just one suitcase for all four of us. Anyway! 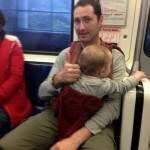 It was an easy enough MRT ride with only one suitcase, stroller, the kids and 3 backpacks!! It took about 45 minutes to get to Danshui. Things got more complicated when we got there and we couldn’t find the accommodation. Three different kind people came to our aid, with no luck until the final one was able to talk to the guesthouse and they agreed to walk down and get us. Lucky, as we never would have found it!! We couldn’t check in until 3pm (first time they haven’t checked us in straight away), and we went had a yummmmmmmy lunch at a nearby food court. It is crazy how good, cheap and easy it was. By the end of this, we were able to check in. It takes a really long time for us all to eat, like usually about 1.5 hours, and Z would happily go on longer!! We were disappointed when we saw our room. We didnt expect much, but we did expect more than what we found. 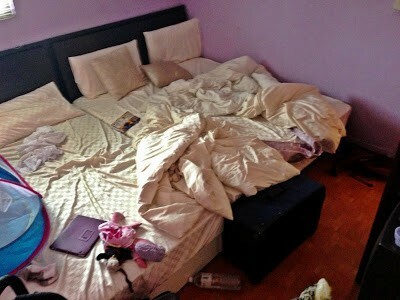 The room was so small, that it was basically taken up entirely by the two queen beds in it. There wasn’t even room for Z’s tiny travel cot to go on the floor, and our suitcase had to keep getting moved around and had to be kept on its side, our stroller in a common area. Lucky, we hadn’t brought all our luggage!! This has certainly taught us that the size of our room is the most important consideration. It was tough going in this tiny room with two little ones, especially as Z only really had room to crawl around on the bed, which he could fall off at any second. The walls were paper thin, and we could hear every noise in neighbours rooms, the street outside and the train line. The bathroom was tough too. It had no windows or ventilation and no shower curtain or anything. So after the first shower, it stayed all wet, damp, smelly and with insects the entire time. I would have found the room ok before kids, but it just wasn’t working for four of us. We tried to get the kids to sleep, but we had missed the right time, and they refused. In the end, we gave up and went out. We headed straight to the waterfront. It was a lovely area, or at least would be on a clear day (it was raining as usual). There were lots of people around, a great atmosphere and lots of carnival like amusements, like dart throwing. Of course, there was also lots of different food. 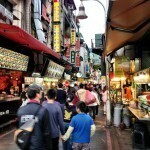 We then walked along Gongming St which is the most famous street in this area. I expected a gorgeous street, and it is meant to be filled with colonial architecture, but it seemed like any other street to me. 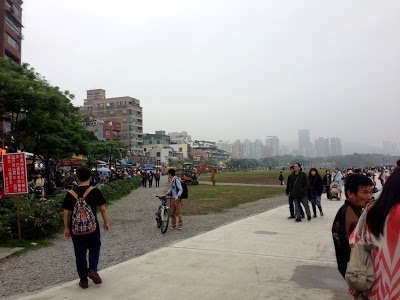 It was also full of people, but I enjoyed the waterfront area more. We picked up food along the way for our dinner. It was nice, but it was ruined a bit by the wet miserable weather. The room also seemed to get to all of us. The kids were hard to get down, and J and I argued (well as much as you can in a tiny room with the kids right there) in frustration. We spent the morning doing an activity that we didn’t get around to doing in Taipei – visiting the hot springs in Beitou. 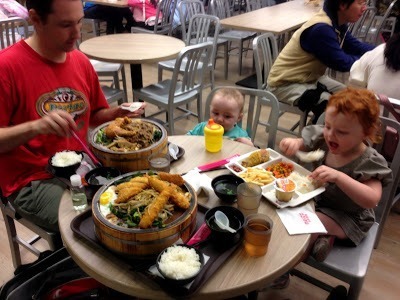 There is more about it in our post about things to do in Taipei with kids. While we were there, J suggested that maybe we forget about the fact that we have already paid for our accommodation and move on somewhere we could be happy. He also put the idea out there that maybe we should change our travel plans more drastically – either alter what we have planned for the rest of our time in Taiwan or go back to Malaysia early even. This was mainly due to the weather. It is wet, miserable and humid every day. It’s a bad combination as it feels like we are just constantly damp, and there is no way to get things dry. We could put up with this when we had our awesome apartment in Taipei, but now that we are dealing with small hotel rooms, it is extra trying. Besides which, we are not getting to do the things we actually want to do, so it all starts to seem a bit pointless. After this stop, we were meant to go to Sun Moon Lake, a reputedly beautiful area in central Taiwan. However, what is the point of going somewhere like that when it is horrible outside? 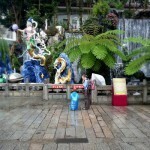 We decided to at least change the next few nights – forget about Sun Moon Lake and our stay in our current hotel. Hard to do as we would lose the money paid, but what’s the point in being miserable? We then looked at either alternate plans in Taiwan or going back to Malaysia the following day. We pretty much decided on an alternate plan of heading to Tainan the next day (somewhere I had really wanted to go but we couldn’t find accommodation for the right place) and staying at the Shangri La there as it had great last minute rates. However, I tried to book it for over an hour, and their website had gone offline!! I then went for a walk, and between the crap weather outside, and the fact I hadn’t been able to book the hotel in Tainan, I decided it was a sign to move on. We decided to fly back to KL. Not that that went smoothly either. I tried to change the Air Asia flight online, but it decided I had three meals booked under my name which is not allowed, so I wasn’t able to submit the change. It wouldn’t let me change the meals either. Ahhhh! I ended up having to ring them. Thankfully, the guesthouse owner let me use their phone, and I was able to fix it. Next, we cancelled a Johor Bahru – KL flight that had recently had the flight time change and we had been given the option of a “credit shell” by Air Asia. This means that we have credit with them that we have to use within 3 months. We planned to use this for a flight onto Singapore for the next day. Of course, this did not go smoothly either. Despite the fact that I got an email from them that there was a credit note for us, I could not use it. I spent an hour while the others went to dinner waiting for my turn to talk to Air Asia via online chat. They said it takes a few days for the credit shell to activate. Great. So then we weren’t sure exactly what to do. It was all adding up to a lot of money. In the end, we booked the flight onto Singapore anyway, 3 nights in Singapore, then 2 in Johor Bahru, and then we have to go back to KL for the 2 nights we already had booked and were unable to change. Hopefully, we did the right thing. I have such mixed feelings over it all, as I do love Taiwan, but this weather isn’t fun and is leaving us with little choice. It is weird to think that yesterday, I was excited to be heading off to see more of Taiwan, and then suddenly today, I’m booking flights to Singapore for the next day – a country we weren’t even planning on visiting this trip! It was a restless nights sleep, as I over thought the decision and started to regret it. On the upside, I did get a fair chunk of an assignment done while trying to distract myself. It was another early start with Z crawling out of his travel cot and straight onto me. Hard to be frustrated (even after only a few hours sleep), when he was looking so damn cute! We got ready as quick as possible, mindful that it was very early and the walls are very thin. I wish I wasn’t so considerate as it makes these situations very stressful! It is impossible to get ready without one or both kids screaming. At one point, I just had to leave the building with S as she went into massive meltdown mode. 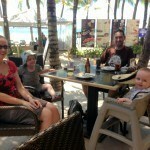 I am looking forward to being back somewhere where these things seem better tolerated. Breakfast was at a nearby McDonalds. They do come in handy when you want a normalish breakfast. Then we went for a big walk to keep the kids outside, and so we all got some exercise. I was still stressing over our decision to leave and regretting it. The weather was still crappy (although not raining at this point) and when we reached a park that we couldn’t use as everything was wet, muddy and there were flies and mosquitoes everywhere, it seemed like maybe we had made the right decision (the mosquitoes are annoying, we are all sporting bites, poor S is covered). Views of Bali (not the one in Indonesia obviously) across the river from Danshui. It was finally clear enough to see something! 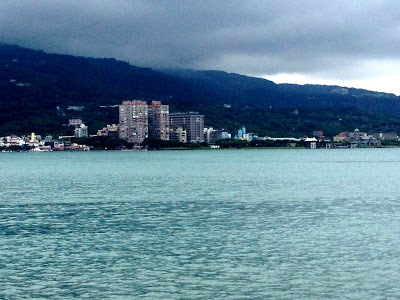 During my restless night, I had decided to try to have a quick walk around the attractions in Danshui, but in the dreary light of day, there seemed little point. It would just be walking around seeing grey. It was the back for a nap for Z and packing for us. We took off as fast as possible. We had a bit of time as we were planning to eat near Taipei main station before going to the airport. However, I was so worried that we wouldn’t be able to get our case out in time, especially as I knew we needed to ring someone to get it and we had no idea how to ring someone and doubted they would speak english if we could. The long train ride back into Taipei seemed to take forever, especially after we had to do a mad dash off the train at one point for a toddler toilet stop. On arrival, we rushed around. I took photos of all the pertinent information on the locker with our suitcase (there are many many different sets of lockers in this area), and we went to the information desk at the shopping center, where thankfully the person spoke enough english to help us. She rung the locker people for us and about ten minutes later, we had our suitcase. Phew! I also managed to get a refund on the bus tickets we had brought to Sun Moon Lake, so things seemed like they were falling into place for us. We had a quick lunch and lined up for the airport bus (even though they left every ten minutes, this was popular and we waited about 30 minutes!). Soon enough we were at the airport which all went smoothly, and we were soon on our way!! Bus to the airport TW$125 per adult and takes about an hour. Our kids were free. 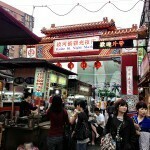 You can also read about eating in Taipei as well as our overall thought of Taiwan.